Welcome to the new Hampton Inn Farmville. 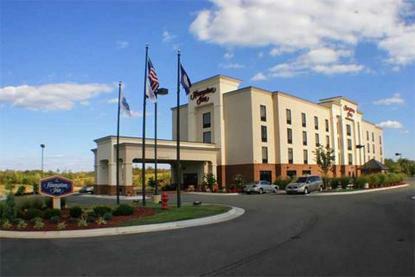 Whether you are traveling for business or leisure the Hampton Inn Farmville has something for everyone and is the perfect place to call your home away from home. We are proud to offer the very latest in upscale accommodations combined with a commitment to provide the exceptional service for which the Hampton Inn is nationally recognized. We are conveniently located at the US-460(Business) Farmville Exit, just minutes from Longwood University, Hampden, Sydney College, Green Front Furniture, Lee's Retreat, VA's Civil War Trails, Southside Community Hospital and Historic Downtown Farmville. Our new hotel offers state-of-the-art technology, including complimentary High Speed Internet Access, our famous ''On the House Breakfast Bar,'' complimentary local calls, complimentary USA Today, an on-site fitness center and two spacious meeting rooms. The hotel also features seven studio suites that feature a separate sitting area, wet bar with microwave and refrigerator, and plenty of extra room for your rest and relaxation.